Y'ALL It's June....and I have a slight confession to make( I feel like I make a lot of "slight" confessions to you) about how my summer is going. I am in the whole weird "summer...now what" phase. PRAISE THE LORD-AH(Cause in the South we drag out ev. rah. thang).. Yes. The cap locks were needed because this is like(my high school English teacher would cringe reading this blog with all of my "likes" inserted in random places) an inner battle that I have with myself every.single.morning. So..I sleep in a little, work out a little, try to do homework then take a break and work on things for next school year, then sleep, eat, repeat, etc. My brain is kind of in a spiral of repeat so I figured that there would be no interesting post today other than the fact that I am linking up with Farley's June Currently, and THAT my friends is interesting enough. I love this linky. I can't wait to look back years from now and read what was going through this crazy ol' head of mine. It's either going to be really terrifying or really, really cool. I am hoping for the later. Listening- Jack Johnson is the MAN, and the waves hitting the boat is just summer bliss. Loving- I am terrified that this summer is going to be so busy that it won't feel like summer. SO, I am loving the current down time. Thinking- I am so excited about this upcoming school year. I have big plans. AND I CAN'T WAIT! It is going to be epic. Wanting- Southwest/Hispanic/Latin food is my jam. I could each it every day. The REAL stuff. Chips and salsa is my weakness. Needing- Who needs to do laundry on vacation? Apparently not I. 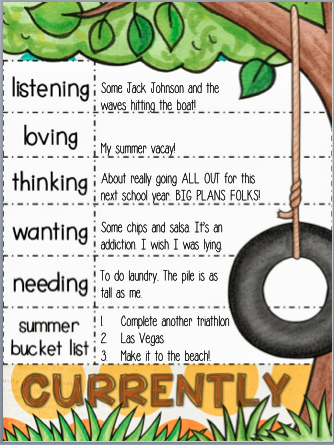 Summer Bucket List- I am going to Vegas in July for the TPT conference. Are you?!?! I came over from Currently! I'm your newest Facebook and Blog follower. Laundry is so overrated! I'm a little jelly that you're in summer vacation mode and I still have two weeks to go! (My high-school English teacher would be shaking her head at my use of "jelly." Enjoy your break! SOOO jealous that you are going to the TpT conference. I hope to go next year. LOVE Vegas! I cannot wait to hear all about your BIG plans for next year. That sounds really exciting! I also cannot wait to hear all about the TPT conference. Enjoy summer!!! Super jealous that you are going to Vegas! Hopefully, I'll get to go next year. I'll be in Tennessee towards the end of the month. We will be in Knoxville and Gatlinburg. Can't wait to see what your BIG plans are. Yay! Another Vegas buddy - hope you come say hello!